We love using recycled materials in play, crafts, and learning (notice that "Recycled Fun" tab up there at the top?) 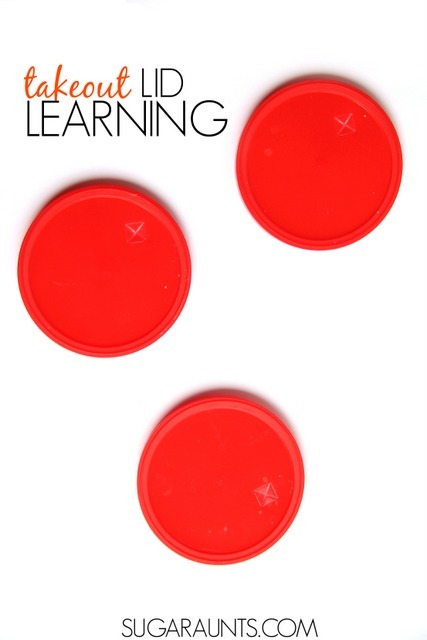 so this lid learning activity is just one way that we've re-used something that we had around the house in learning. These recycled lids are just the plastic lids that your child gets at a restaurant. My kids always want to carry their dripping, empty cup home after a dinner out, so we end up with a stack of plastic cups and lids. They make the perfect fine motor and learning tool! Use take out lids in learning! fine-tip dry erase marker (these are my favorites! ), you can use the lids again and again for so many learning activities. We used our lids recently to practice sorting sentence types. I wrote out the four types of sentences: Imperative, Exclamatory, Interrogative, and Declarative. bright red yarn . These were taped to the wall for overhead activity and a movement task. Adding movement to learning is a great way to get the whole brain involved in building and retaining learned information. I then wrote out different sentences on other plastic lids. My daughter sorted these by stringing them onto the appropriate string. This is a fantastic way to practice first grade English language arts and sentence types. This activity was a big success and a fun way to practice sentence type identification with a fine motor component. Stringing the lids onto the yarn requires a tripod grasp and bilateral hand coordination. This post is part of our month-long Learning with Free Materials series, part of the 31 Days of Homeschooling Tips as we blog along with other bloggers with learning at home tips and tools. Join our newsletter subscribers for a weekly email so you don't miss a thing!